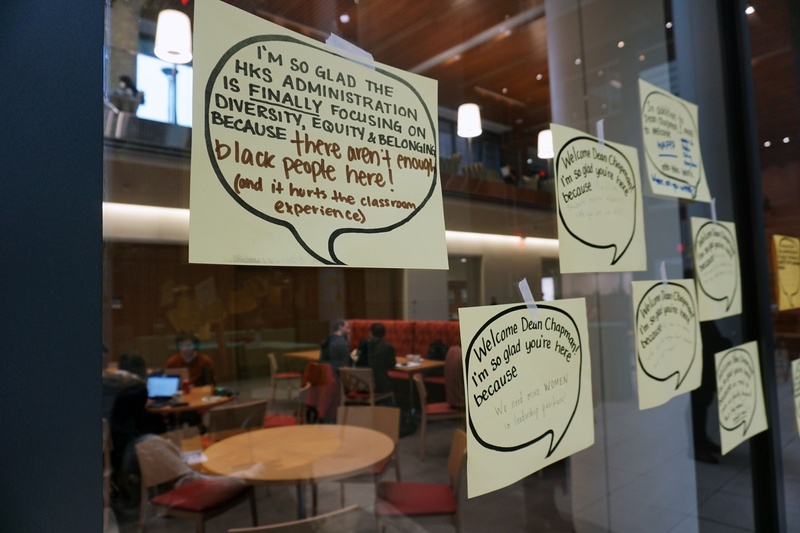 Signs posted on the walls of the Harvard Kennedy School welcoming the school's new diversity dean, Robbin Chapman. The Harvard Kennedy School has taken a number of steps in recent months to address concerns students and faculty raised about diversity at the school last year — and students have praised the changes and pledged to keep pushing for more. Activism around diversity came to a head last spring, when students held town halls, hung posters around the school, and organized school-wide events to call attention to the dearth of women and minorities at the school. Concerns raised years earlier prompted Kennedy School Dean Douglas W. Elmendorf to organize an internal task force in 2016 dedicated to creating a report about the demographic makeup of the school, the diversity of its curriculum, and the experiences of people of different genders and races at the school. The 76-page long report, circulated internally starting in May 2017, highlighted stark underrepresentation in the racial and gender makeup of HKS affiliates. African-American students constituted only 4 percent of the Masters in Public Policy program, the school’s largest degree program, in 2015. “Hispanic Americans” and Asian-Americans each made up 7 percent of MPP students in 2015 — and the school saw declines in the percentage of students in all three categories between 2005 and 2015. The report recommended the Dean hire an administrator to focus solely on diversity and inclusion. Elmendorf appointed Robbin Chapman the Associate Dean of Diversity and Inclusion in Jan. 2018. Chapman is now working at the School “full-time,” according to Kennedy School Dean of Communications Thoko Moyo. Even as the school has made strides, Priyanka Kaura — a student involved in activism last semester — said students will continue to advocate for additional measures to diversify the school. Camilla N. Taufic, another student leader, said Chapman “should be a partner” to the group. Chapman could not be reached for comment. Apart from hiring Chapman, the school also held a structured retreat focused on diversity and inclusion over the summer, which faculty and administrators attended. Kennedy School student Eamon S. O’Connor called it a “notable” development in the administrators’ response to last year’s protests. Moyo wrote in an email that “some” faculty and staff underwent training on diversity-related issues before the academic year started. “The trainings covered a number of topics including: unconscious bias; making productive connections, issuing and accepting observations (bystander skills),” Moyo wrote. O’Connor said the school’s response has exceeded his hopes. “The fact that it happened, just kind of miles beyond what we could've expected,” he said. Elmendorf has appointed several women to high-level administrative roles within the last year, according to an email he sent in August to Kennedy School affiliates. Iris Bohnet, who served as the school’s academic dean from 2011 to 2014, is returning to the role after Kennedy School Professor Archon Fung stepped down from the position. Janney Wilson, the school’s chief financial and administrative officer, was appointed to the role of executive dean, and Debbie Isaacson, an alumna of the school, will now serve as the school’s senior associate dean for degree programs and student affairs. These appointments come after a number of African American women left high-profile administrative positions at the school within a span of six months. One specifically cited inadequate support from the school as the reason for her departure. Taufic said the group of student activists, as well as new students joining them this semester, “are really excited” about the work and community they hope to build within the academic year. The group circulated flyers to encourage participation in diversity activism at the school’s admitted students’ weekend in the spring.